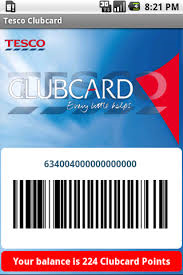 At last, you no longer need to worry about leaving your Clubcard at home. A new version of the Tesco Clubcard app, downloadable from the Apple and Google app stores, now includes a version of your Clubcard card which can be scanned. It currently shows as a QR code which, apparently, cannot be scanned by all stores as some have not been upgraded with the required technology. Most will be OK.
You need to open the app and go to ‘At The Till’ to get the QR code to show. The app also shows your current Clubcard points balance. You cannot see where the points have come from, unfortunately, so it isn’t hugely useful when it comes to checking if you have received what you are due from past promotions. There is also a store finder tool, should you find yourself with a desperate need to track down a Tesco immediately! It isn’t the greatest app in the world, to be honest, but I have downloaded it anyway because I know – one day – I will find myself in a Tesco store and would otherwise regret missing out on some points.